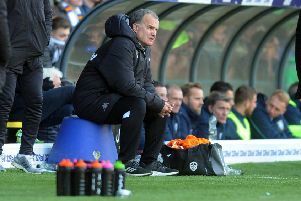 Second half goals from Alex Mowatt and Billy Sharp enabled Leeds United to bounce back from two straight defeats with a 2-1 win over top six side Ipswich Town at Elland Road. The Whites deserved their victory, but had to survive a nervy finish in which goalkeeper Marco Silvestri got his fingers to the ball to turn Daryl Murphy’s penalty onto the post. It was a case of going from zero to hero for Silvestri after he was at fault for Ipswich’s goal 10 minutes earlier when he let Freddie Sears’ shot squirm out of his hands to dribble into the net. The game exploded into life in the last 20 minutes after a goalless draw looked on the cards. Despite having a chance to climb back into the top four Ipswich carried little threat in the first half, managing just effort on goal when Chris Wood’s volley was blocked. Leeds had more going forward and could have been in front in the sixth minute when Sharp’s volley from a Lewis Cook cross was going goalwards only to hit defender Tommy Smith, who seemed to know little about his intervention. Sol Bamba looked a threat when he got forward from the back and he sent a looping header onto the top of the net from a Mowatt cross. Bamba glanced a header wide from a corner and put another header off target after jumping to meet a free-kick. There was a controversial incident on 34 minutes as Leeds harried the Ipswich back four into a mistake and Sam Byram’s cross was headed wide by Sharp. It looked easier for the striker to score from no more than six yards out, but his reaction and that of team-mates suggested he had been pushed, but no penalty was given as yet another United shout fell on deaf ears. Ipswich initially looked to have sharpened up at the start of the second half as Silvestri was forced to make a fine save to keep out Tyrone Mings’ header. But Leeds created another opportunity as Sharp turned in the box only to see his shot half blocked before being easily saved by Bartosz Biakowski. The game then fell into a bit of a lull aside from a goalmouth scramble in the hosts’ box when Liam Cooper made a terrific block. But all that changed when Byram was held back by Mings and from the free-kick on the edge of the box Mowatt bent the ball round the wall into the net for a great opening goal. Ipswich hit back within three minutes as Sears’s low shot did not look too dangerous, but somehow crept under embarrassed keeper Silvestri. But within another three minutes United scored again as substitute Mirco Antenucci sent Cook clear down the right and the midfielder’s cross was superbly volleyed home by Sharp, who had fully justified the decision to play him as lone frontman again. The action was suddenly coming thick and fast as Kevin Bru’s shot from the edge of the box was well held this time by Silvestri and Cook’s shot at the other end was comfortably saved by Biakowski. Ipswich were handed a lifeline seven minutes from time when Bamba was adjudged to have deliberately handled a tricky bouncing ball in the area. But Murphy’s penalty was just kept out by Silvestri. Mowatt could not repeat his free-kick heroics with another shot near the end and Byram had a volley blocked, but United saw out the closing stages to complete their excellent victory. Leeds: Silvestri, Wootton, Bamba, Bellusci, Cooper, Byram, Cook, Murphy, Mowatt, C Taylor (Antenucci 68), Sharp (Morison 86). Ipswich: Biakowski, Chambers, Smith, Berra, Mings, Anderson (Bru 61), Skuse, Tabb, Parr, Varney (Murphy 65), Wood (Sears 72).